There are several practical reasons why you may want to cool the components inside your 3D printer. The first and most important is to make sure that your printer remains operational and free of maintenance. 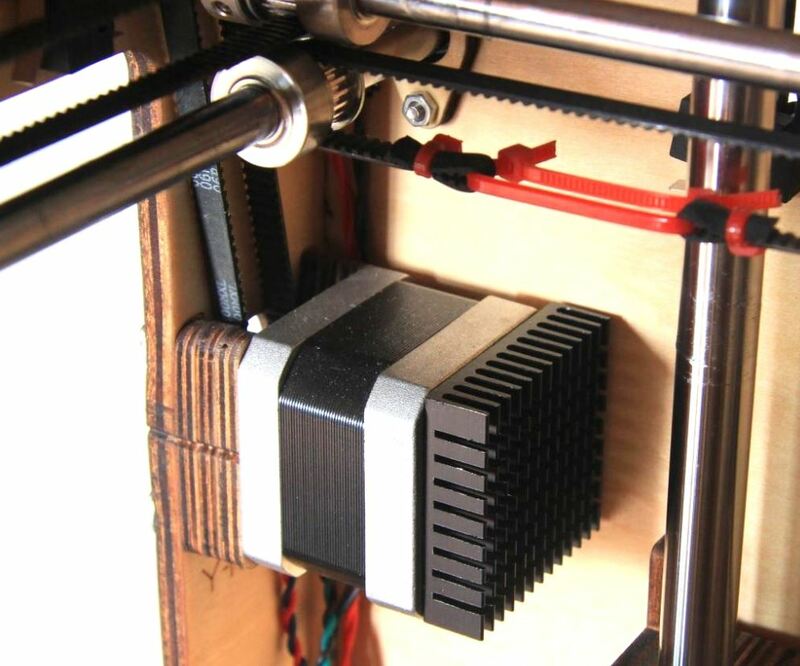 One of the most critical components for most 3D printers is the stepper motor. These are the motors that are responsible for extruding and positioning the model on the x,y and z planes. These three motors can run so hot that they will burn you if you try to touch them during a print. While these stepper motors are designed to run hot, there is a limit to how hot you want them to get for prolonged periods. Therefore, we decided to dedicate this page to breaking down the fundamentals of stepper motor cooling. Industrial grade stepper motors have magnetic cores which begin to degrade when they reach temperatures above 80C. During warm days when the ambient temperature may be above 30C, the stock stepper motor surface temperature will hover between 70C and 75C for long print durations at moderate extrusion speeds. While this is not inherently bad for the printer’s longevity, it does limit the amount of experimentation that can be done safely with the stock setup. A perfect example of this is attempting to increase the speed of rough prints. Increasing extrusion rates while maintaining a constant output temperature will require additional torque from the extrusion motor. This additional torque will require more power which creates thermal dissipation through electro-mechanical inefficiencies. In other words, the motors get hotter as you try to print faster. 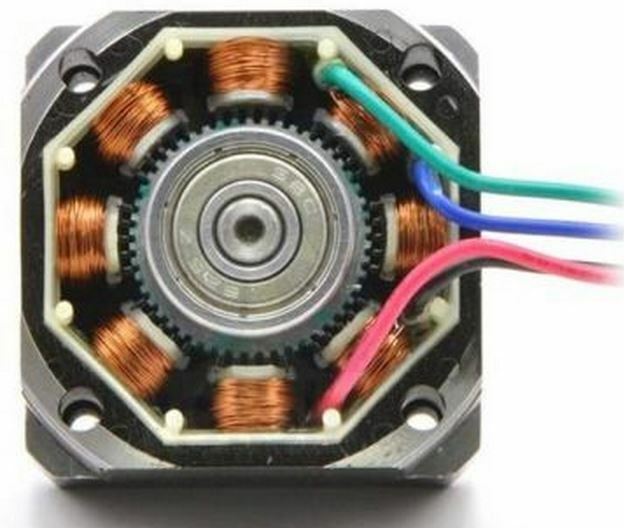 On a hot day, pushing your stock stepper motors at high speeds for prolonged periods may result in premature degradation of the magnetic core. Another practical example is the common attempt to minimize delamination due to drafts that enter the build area. This is often done by enclosing the surrounding area and retaining the heat from the build platform and hot end. However, this additional heat and lack of airflow can cause many problems for your 3D printer if not accounted for. This is true even if you are running your printer at moderate speeds in an enclosed space. This is the general equation for convective heat transfer which depends on a heat transfer coefficient (h), the surface area of the motor (A1) and the difference in temperature between the motor and ambient air (ΔT1). Plug your original values in here. This equation introduces a new scenario with a different surface area and temperature delta. This is where the heat sink values will go. Depending on which situation you are looking at, one of the two equations above should be used. The first case represents adding an enclosure to the system such that the power being dissipated by the motor remains constant while the temperature difference required for heat transfer changes. The second case represents increasing print speeds which will increase the required power dissipation while the heat transfer due to temperature differential remains constant. We will continue to use the first case for this demonstration. The common heat transfer coefficient drops out. This is a simplification as the heat transfer coefficient does change some when adding an enclosure since the wind flows are reduced to near zero. However, these changes are negligible when integrated across the entire print duration. This is because significant drafts are typically periodic and brief on unenclosed printers. These instances are enough to create delaminated layers on the micro level, but are not very significant with the level of continuous heat transfer we are dealing with on these stepper motors. Here is the first significant finding for our calculations: the area multiplier required to maintain a constant surface temperature is inversely related to the ratio of temperature deltas. For example, if ΔT1 is 10 and ΔT2 is 5, you would need to double the effective surface area to maintain a constant motor temperature. This equation introduces new variables, initial surface area (A0) and final surface area with heat sink (Af) to make the scenario clearer. In this equation As is the area of a single stepper motor side, assuming the motor is a perfect cube. This equation introduces two new variables: as the surface area of the applied heat sink, and x to represent the number of heat sinks to be used. The area of the heat sink includes several new variables which are relatively easy to understand. Variables h and l represent the overall height width and length of the heat sink. The variable n represents the number of fins that are on the heat sink and represents the fin thickness. Combining (6), (8) & (9) provides us with an equation that has the number of heat sinks as the single independent variable to solve for. All other variables can be easily measured on your system.